Throughout this summer we are recalling Brother Roger—his birth a hundred years ago, his arrival in Taizé 75 years ago and his death ten years ago. If, while the world war was raging, he founded a community, that is because he was convinced that Christians should be reconciled in order to be together a ferment of peace in the human family. He did not want to remain theoretical, but to put into practice, even on a small scale, the peace he wanted for humanity. He often told us brothers or the young people who came to Taizé: put into practice the little you have understood of the Gospel. Nobody understands the entire Gospel by themselves, but if we put even a single word into practice, our understanding deepens. One of the sayings of Christ that marked Brother Roger is this one: Whatever you did for one of the least you did for me. He was especially attentive to children and to those wounded in body or soul. He knew how to make them feel welcome, give them a place, celebrate with them. How many people he listened to went away comforted, more conscious of their dignity and their potential! How many people understood through him that their lives mattered, that they could take on responsibilities! Very early he sent out brothers to live in situations of poverty, first near Taizé, then on different continents. And at an advanced age he himself went on several occasions to share for a time the life of the poorest. When we brothers leave Taizé to live in difficult conditions, we do not go as an NGO. Of course, in some emergency situations providing material assistance is absolutely necessary, and we do that too, to the best of our ability. But our priority is different. Our priority is to live a simple presence, to try and understand situations, to be close to those who are suffering by sharing their daily lives, to grasp better and open our hearts to all the riches of other cultures, to offer a welcome, to create by small activities of friendship. And often, again and again we make this amazing discovery: helping the poor is not a one-way activity; they also help us, for example, they help us by making us more aware and more accepting of the fragility of existence and the inestimable value of every human life. Today some of our brothers live in this way in small groups on different continents. And these days all these brothers are beginning to return to Taizé, so that we can be here all together around August 16, the anniversary of Brother Roger’s death. I spoke to you of the attention that Brother Roger showed to wounded people. 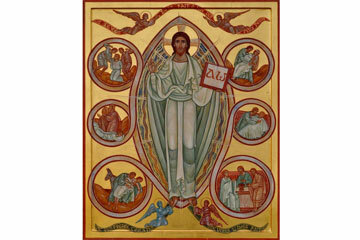 Here in the church we have a new icon, the icon of mercy. It shows the face of Christ who looks at us with love. Through this icon Christ speaks to us. Six small medallions tell the story of the Good Samaritan, which is found in the Gospel of Luke, chapter 10. We see the man left half-dead beside the road, the priest and the Levite who pass by and continue their journey without stopping. Then a stranger comes, a Samaritan. He approaches the wounded man, gives him first aid and brings him to an inn. This icon is like a summary of the Gospel. Christ looks at us with love. In him God has come close to wounded humanity. He does not come to condemn but to heal and cure. And he invites us to do the same. Like the Samaritan, we should not be afraid to come close to those who are wounded, abandoned alongside the road. I am thinking in particular of migrants whose numbers are increasing across the world. In a world where violence and the fear of foreigners seem to become stronger and stronger, it is important that we find the source from which to draw peace. You know that every Sunday afternoon for a year now we have been gathering in the church for half an hour of silence and prayer for peace. Of course one wonders what half an hour of silence together can change in the world. I think it is not nothing. We offer to God our desire for peace and he makes it bear fruit somewhere in the world, without our knowing how or where. It is a powerful act to wait together for God’s peace for the world. I would now like to turn the mike over to Mary and Aman from South Sudan. Their presence among us is invaluable. They are peacemakers, very simply, in their young country that is going through great difficulties. Good evening everyone, I am Aman, I and Mary come from the African’s and the world’s youngest nation, South Sudan. We bring to you greetings and thanks from the Loreto sisters and the students in Rumbek (South Sudan) and especially to the brothers of Taizé a great thanks for accepting the Lord’s call to come to our conflicting society. The Taizé brothers in Nairobi, Kenya, visited us in the Diocese of Rumbek in a single girl’s school administrated by Loreto Irish sisters. In the school we conduct our prayers with Taizé songs once after every two weeks and this has given us great inspiration because we are now able to see the importance of prayer in our life. We are experiencing war and lack of respect for human life, but we have a great hope that the forgiving Lord will one day restore an everlasting peace in our beloved country. Today, we invite you and the entire world to pray with us for peace, love, respect and understanding in South Sudan.